There is a question that I have asked myself a lot (mainly from the numerous debates I've had with Lindsay) on what makes a good traveler. How do we, as members of a traveling boarding school, supplement our experiences of exploration with the writing and notes that we make before, during and afterwards? While enrolled at THINK Global School, students are encouraged to be creative during the course of their studies and travels. When the students document these thoughts, we are often delighted with the results. 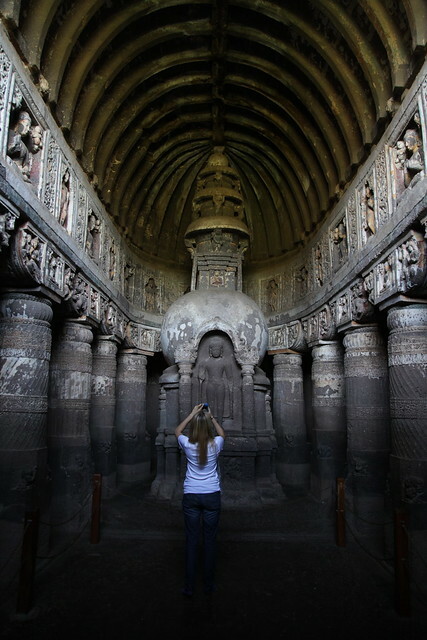 In “What makes a traveler?” 12th grade student Megan K. asks just that while wondering if the knowledge she gained on a journey to the Ajanta and Ellora caves in Aurungabad will shape the rest of her term in India. There is a question that I have asked myself a lot (mainly from the numerous debates I’ve had with Lindsay) on what makes a good traveler. How do we, as members of a traveling boarding school, supplement our experiences of exploration with the writing and notes that we make before, during and afterwards? This past weekend had me questioning what makes a good traveler. Is it the ability to handle situations that may arise? Is it the understanding of alternate cultures and viewpoints? Is it the honesty to accept that you aren’t able to explore every situation? Our weekend was a challenge, I will not lie about that. I’ve experienced long journeys before, but the fifteen hours driving between Hyderabad and Aurangabad was difficult. Extremely, deafeningly difficult. That is, however, part of the experience of India. Our bus had been late because of planning errors, proper forms for taking certain highways hadn’t been processed, and the deep monsoon season had not finished in its normal fashion, leaving roads disastrous for large coaches like our own. Multiply that by 25 students and 5 teachers in a sardine can of a bus, and we definitely have a worthy story. After our late arrival (imagine sore teenagers staring at a clock in the lobby which glares 3:30 am with angry hands), the five hours of sleep fueled my body in some magical aura, and I woke up feeling somewhat refreshed. The act of traveling, I realized, can be as much a cure as a disease; it pulls at your lungs and tears at your eyes, but it also awakens something deep in your heart: the desperation for adventure, exploration and discovery. After three more hours trapped in a bus, we emerged outside of the Ajanta Caves. My prior expectations of India had been flat, crowded and deafeningly noisy. 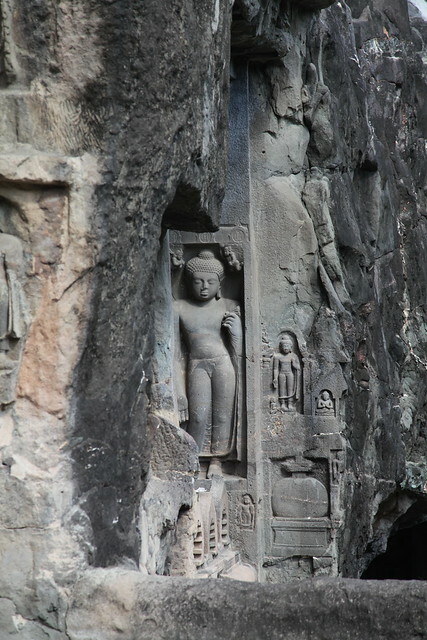 Ajanta countered all those beliefs. It was green, emotively silent, lush, and stark. The growth and brush of the trees and bushes were starkly cut by the caves; facades of yellow and grey etched deep into the valley’s edge. The sounds of water and birds set the backdrop for the caves as we wandered. That thought left me questioning the rest of my experience in India. How does the centralization of a nation add or subtract from its livelihood? We are surrounded by it every time we enter the city and even just society outside of Indus. The sheer volume of people can be disheartening and the levels of poverty that we are forced to comprehend are hard, but comparing the single party mentality of this culture, so focused on growth, to the small city-states that governed back then with the Maharajahs and the shamans makes me question whether the decentralization that many western countries are terrified of is really the best option for this subcontinent. This is what traveling is in my experience. Gaining more knowledge, more opinions and more questions to fuel my time spent traveling and exploring. If you cannot find your passion within your experiences, something that makes you tick, concerned or entirely confused out of your mind — then you haven’t found something worth traveling for yet.